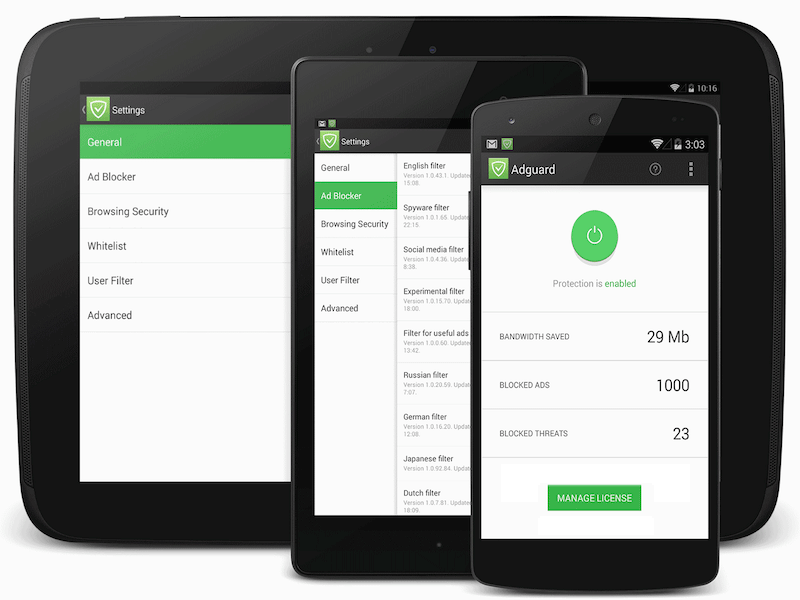 Adguard for Android: version 1.1.835 released! We know you all are eager to see new Adguard 1.2, and believe us, we also can’t wait for that moment. But there is still some work to be done, and meanwhile we would like to present you 1.1.835 update. Added support of Habit browser and Yandex browser beta. Fixed a bug with local network exclusion. Now local network is properly excluded on all devices. This should fix some compatibility issues: working with local FTP servers, Sonos, Amazon Fire TV, etc. Fixed filtering issue with websites which use Content-Security-Policy. Fixed an issue with proxy+automatic filtering mode on devices with kernel version 3.10. Fixed Adguard filtering in case of using proxy server with port 80. Fixed UI issue when bandwidth saved value is more than 1GB. Fixed major bug in the filtering engine. Fixed Google Play Music compatibility issue. Fixed an issue with waiting for ROOT access on device boot. As you know, Adguard was almost impossible to use along with majority of existing firewalls. We had no other choice but to develop our own built-in firewall, so you could block stuff while blocking more stuff! Long-awaited user filter importing feature. For those of you who like to customize things, life will be much easier. Who else wants a widget to enable/disable protection in one tap? We do! So it will be implemented in 1.2 update. And that’s just the major changes, there will be more. Thank you for using Adguard! When discussing Adguard ad filters, there is often one topic that causes disputes – whether shall Adguard block this or that ad. By framing the rules we stick to special criteria. Now it’s time to publish them. Our criteria are much similar to EasyList Policy, which we find correct and appropriate. Nevertheless, we have put changes to some points. Today we are releasing another unscheduled, but priority update for Adguard 5.10. This update contains many useful and important changes and fixes. We recommend that all our Adguard for Windows users upgrade to this version.